A primary instruction for operating the CATTt is just the principle that everything found in the sources goes together, that the sources are all talking about the same “thing.” The notes on the readings make it easier to grasp a similar intratextual coherence: D&G are talking about the same thing at every point throughout their complex account: the philosophical concept. The limits organizing our plane of immanence form a tension between Commerce and Chaos, between advertising and disaster. The image of thought territorializing the plane is that of the commodity. Our concept must deterritorialize this arrangement, and construct a new image of thought. The elements of our assemblage include a discourse of popular culture or mass media spectacle structured as commodity (Contrast). Commodity expresses the majority opinion of our situation, including the terms of the policy debate. Target establishes the applied region of our thought, which is a disaster and the way in which it is expressed in public policy debate, also organized as opinion. The overlap of Target with Contrast is the chapter in Marchand on advertising during the Great Depression (and also on therapeutics). The grammatological analogy is that what natural language was to the literate category, pop media (commodity) discourse is to the electrate concept. In each case, the philosophical thought extracts its category from a pre-existing discourse. The key to our poetics is to learn from Theory (D&G) how philosophy designs the vital anecdote in which our conceptual personae perform the thought. The relevant documentation in WIP? is the references to modernist arts practices (literature, painting, music). Philosophy does for the noumenal what art does for the phenomenal. The mental landscape of thinking relates to the problem plane by means analogous to those invented by Cezanne to express the physical landscape. “The difference between conceptual personae and aesthetic figures consists first of all in this: the former are powers of concepts, and the latter are the powers of affects and percepts The former take effect on a plane of immanence that is an image of Thought-Being (noumenon), and the latter take effect on a plane of composition as image of a Universe (phenomenon)” (65). The CATTt context directs us to adopt the modernist arts plane of composition as a relay (Analogy) for treating the conceptual anecdote, in order to create a vector or a different turning within the problem than that of commodity. Hubert Damisch turned the thickness of the plane into a genuine concept by showing that “plaiting could well fulfill a role for future painting similar to that performed by perspective.” [ … ] From literature to music a material thickness is affirmed that does not allow itself to be reduced to any formal depth. It is characteristic of modern literature for words and syntax to rise up into the plane of composition and hollow it out rather than carry out the operation of putting it into perspective. It is also characteristic of modern music to relinquish projection and the perspectives that impose pitch, temperament, and chromatism, also as to give the sonorous plane a singular thickness to which very diverse elements bear witness (WIP? 195). The point for the poetics is not yet to say exactly how this modernist noumenon will appear, but to note its place in the process, with the instructions to render it using our Analogy, drawn from a specific arts procedure. If advertising provides anecdotes of opinion, philosophy brings into its anecdotes the dimension of the unthought. The “plaiting” in our context refers to the vectors of forces passing through our disaster (list here the institutional and collective agencies found in your policy documents). Art and science can show philosophers their versions of the vectors (the distortions of Bacon's portraits; the phase space diagrams of complexity), but philosophy must create its own version of what may happen (a means to think what is virtual, potential, unthought). Our poetics proposes a concept for which thinking is a kind of movement (the witch’s flight): the concept proper (event) is not a figure (as it is for sages or poets) but a connectivity, a passage or trajectory between domains. Such connections compose rhizomes. Thinking as creativity may break up one set and recompose it into another (disconnect Figure from Religion or Commodity and reconnect it with philosophy). Event as vantage point on the plane must help us notice and experience the vectors passing through us, the phase space of attractors producing the field of our situation. 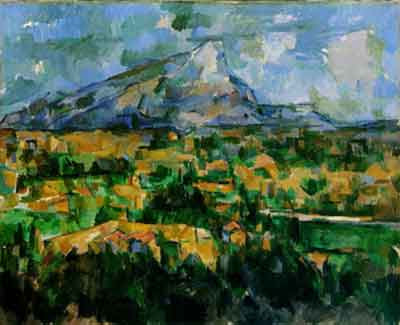 “We wlll speak of the brain as Cezanne spoke of the landscape: man absent from, but completely within the brain” (210).